It was announced earlier this week that Adam Schefter along with several Green Bay Packers offensive lineman launched Meet The Protectors. Meet The Protectors is a campaign by Gillette highlighting the superior shielding features of the new Gillette Fusion ProShield. The Valley Stream, New York native Adam Schefter graduated from the University of Michigan in 1989, where he also began his newspaper career as a member of the Michigan Daily Newspaper. Between 1989 and 1996 Schefter worked for various news outlets such as the Chicago Tribune, The Post-Intelligencer, and then ultimately the Rocky Mountain News in Denver, Colorado. In 2004, Schefter joined the NFL Network as an NFL insider. 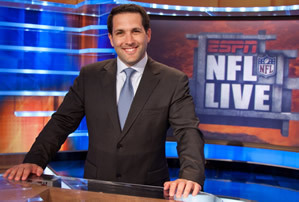 For five years, Schefter worked primarily with NFL Network but in 2009 he joined ESPN as an NFL analyst. Over the last six years with ESPN, Schefter has won many awards as best media member and media person of the year. Along with his very well enjoyed NFL work, Schefter has also published many books such as Real Sports Reporting in 2003 and Romo: My Life on the Edge: Living Dreams and Slaying Dragons in 2005. Earlier this week it was announced that Adam Schefter along with many members of the Green Bay Packers offensive line have helped launch Meet The Protectors by Gillette. Schefter is one of the most notable people working within the NFL’s constant media frenzy and it should prove beneficial for both Gillette and Schefter. If your company is interested in finding out availability and booking fees for an NFL insider such as Adam Schefter or other sports celebrities for a Keynote Speech, Fundraiser Event, Guest Appearance, or Football Camp, call us at 1-888-246-7141.